My son is an aspiring baseball player. If you’re familiar with the game of baseball you know it’s a very cerebral game. In the batter’s box every movement must come together perfectly – from the way the bat is held, to the twist of the wrist as the swing is moving through, to the precise movement of the hips and legs to get power in the swing. The baseball swing is a symphony of movement that crescendos precisely as the ball meets the bat. But this is just one aspect of a very difficult game. How do these young players gain an edge? Of course, lots of practice and money tossed at batting, fielding, pitching, and even running coaches. We’ve been to several coaches that have helped my son over the years. And, each one has their own set of tools they use to help young players. But over the years I’ve found the coaches that use this one tool to be the most effective. Can you guess what it is? If you said video, then you’re right! 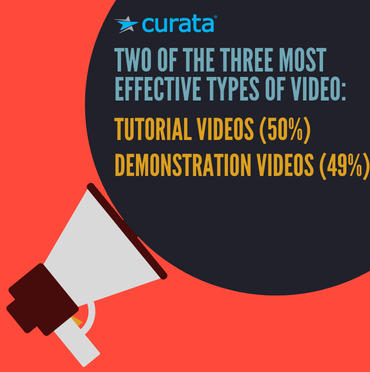 According to Curata, two of the three most effective types of video are tutorial videos (50%) and demonstration videos (49%). If you consider this along with the overwhelming number of stats that show the value of video marketing, then you may be able to convince your company to embrace video as a means for communicating with your target audiences. In my last blog on this subject, we explored how important video marketing is. And I’d be willing to bet that video marketing is one the of first forms of communication that most companies ignore due to fears over costs, content and bandwidth. Your partner makes the difference – Find a partner that understands your video marketing goals and shares the same views for how to get there. Part of this discussion early on is budget. Look at their sample videos and understand the costs of the videos they’ve produced that you like. Less is more – Keep your videos under two minutes as visitors lose interest beyond the two-minute mark. Visuals help tell the story – Work with a production company that is skilled in motion graphics. Videos give you the opportunity to take your message to the next level. Imagine a simple infographic brought to life in an educational video. Keep it authentic – An over-produced video may send the wrong the message. Authentic videos featuring employees vs. paid actors, shot in your office vs. a studio may help the viewer to ‘connect’ on a personal level with your company. And it cuts costs dramatically. Demo, Training, How-to videos are very powerful – We’ve already explored the importance of tutorial and demo videos. Keep this in mind when you want to show the ease with which your product can be installed or used. Keep it simple – Enlist your marketing team to create a script that is easy to bring to life in video. Whether it’s a talking head video or a video completely done in motion graphics – having a clear plan in place before starting the process ensures success. Give it some marketing muscle – Be sure to put a solid marketing plan in place to drive viewers to the video. Ensure that you’re pushing the video to target audiences via your website, social media, email marketing, and advertising. Give it a try. Have some fun with video and weave it into your marketing program. Let us know if you’ve had success with video marketing. We’d love to hear the challenges you overcame and how your videos were received by your customers and partners.